Who are the Chanctonbury Ring Morris Men? We are an all-male Morris dancing ‘side’ based in central Sussex. We were formed in Shoreham way back in 1953. 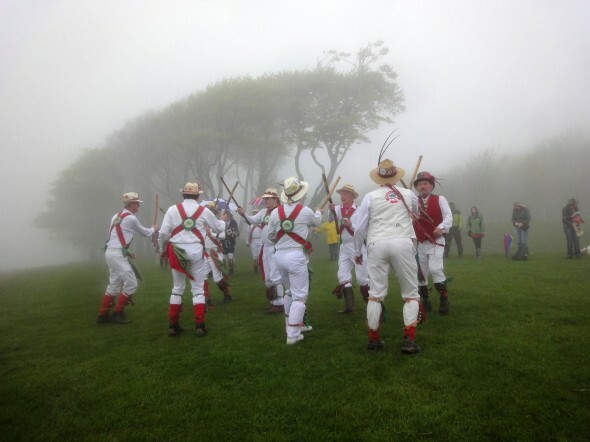 We dance mainly Cotswold, but we also have a strong North West side (‘Clog’), with many men dancing both styles. Like many local clubs, ‘Chancs’ is looking for more men to come and join the team. There’s no age limit but between 16 and 60 is ideal! Drop in and talk to us at our winter practice nights from October to April. We dance there from 8-10pm every Wednesday and then have a beer or two, and often some music, at a pub afterwards. There is no cost involved – just the occasional annual fee of £10 to cover hire costs of halls etc. Beginners are welcome to come and chat with the men or ‘have a go’, and the first season dancing out usually only needs to know one or two simple dances. Of course, we also welcome musicians to join us too; and men from any other Morris sides who fancy a change, or who have moved to the area. During the summer we then dance out, mainly at pubs, on Wednesday nights, and at events on the occasional weekend.